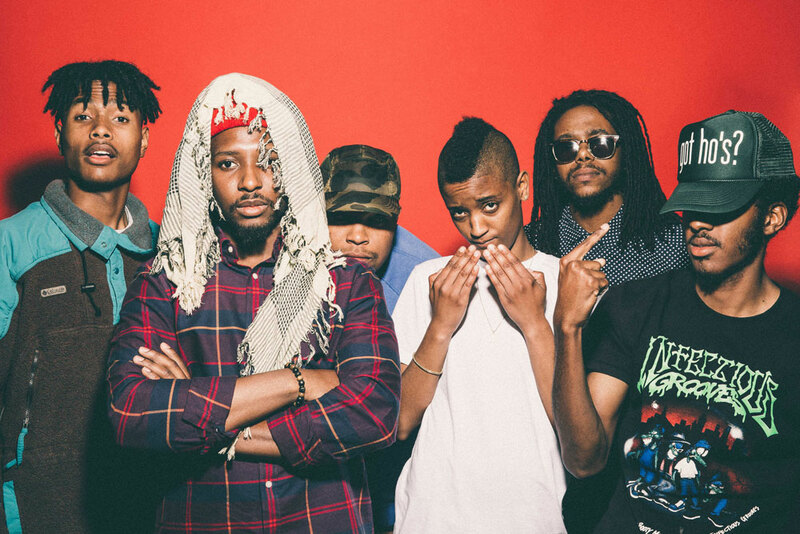 At the peak of Odd Future’s infamy – thanks to head honcho Tyler, the Creator’s penchant for shock rap – Syd the Kyd’s music was already a counterpoint to the immaturity outsiders had associated the collective with at the time. As The Internet, along with Matt Martians, she’s expanded upon the nu soul-indebted alt r’n’b sound of hers as an individual artiste into a full-blown band setting – when performing live that is. It wasn’t until last year, when third album Ego Death dropped with each band member’s mug proudly emblazoned on the cover art, that they’ve brought the live experience into the album – effectively pulling every contributor into the band’s lineup. With their recent Laneway Festival Singapore ’16 performance as an exemplar of their growth, JUICE spoke to both Syd and Matt and went on to talk about the death of ego and being more overwhelmed by relatives at family gatherings than relative fame, among other things. Hi guys! We really like your third album, Ego Death. But we can’t help but wonder whose ego is dying on this album? Matt Those words, it can mean what it really means but it can also have other meanings. We live in a very egocentric society right now. A lot of people need to calm down their egos. Do you go through a different kind of creative process for this album? S Yeah, it’s kinda different. We made most of the songs all together. Like, as a band, in a studio, playing together. And you know, we were into the live music thing with the previous album. So with this album we wanted it to be a little bit harder. We wanted to go back to our first album kinda vibe, mixed with some of the live elements. This one is a little different. There are beats that Matt made with Steve [Lacy, producer] where Matt was on the drums and Steve was on the guitar. Everybody did something in different ways for this album, and I focussed on the writings. And, um, I reached out to a few different songwriters that we really like to make some great songs! Is that why you finally put on some faces on the cover of the album? Because we notice that on your two previous records, the cover is more into graphic, abstract artwork. But now you have faces on the cover. Does it somehow reflect the creative process behind it? M That’s an interesting question. Because it really actually does. Like, you know… It’s not like we’re ashamed of our first two albums, but this is the first album where we feel very proud. We wanna be proud of our work and show our faces. So I think that the cover art definitely reflected the creative process of this album. And we definitely want to give credit to all the people who had helped us. With the two previous albums, we had help from other people as well, but a lot of people don’t know that. So now we want to put those people on the cover of Ego Death as band members, as musicians, because it feels good if you can put your face on your work. So I feel it’s important that we show our faces. Now that you’re well into your third album, what have you learnt so far as a band? M I think we’ve learnt a lot, not just music-wise but also business-wise. We went through the first two albums trying to understand how the record industry works. Understanding that a lot of things aren’t personal and it’s just about show and proof, you know. You really gotta go out there and meet various people. At the end of the day, you make whatever you want on top of it. But you really gotta try to make something that hits people, something that they can take home. On the second album, a lot of the beats switched a lot. Now I understand that people – in order to understand the music – need to have a steady beat. That’s what I learnt, trying to find a good balance between being weird but also being relatable, I guess. With all the attention you’ve been getting recently, does it get overwhelming to live up to the hype? S Um, not yet. I mean, I would say going to family functions are more overwhelming than anything (laughs). I mean, for real! I was just at my grandmother’s birthday the other day, and everybody and everyone showed up. There were so many people there, and they were watching our performance on The Late Show with Stephen Colbert, and when I walked in they were all screaming. But other than that, it’s pretty much chill. We’re trying to take things one at a time and try not to overpower ourselves by putting too much on our plate. I think that’s the best way to live by, you know? As we’re getting more seasoned now, we probably take on more stuff and doing more things. But as of right now, we’re just trying to do the best we can and stay on top of everything. The Internet played at Laneway Festival Singapore ’16 on Saturday 30 January ’16.